To refer a patient with a challenging problem, please call us at 214-618-4405, or send an email to [email protected]. We can arrange an internet connection to allow surgeons to interact with us during the operation of a patient they refer to PARC Urology for care. Unedited video will then be sent to the referring surgeon after the procedure for future review. To refer a patient and schedule a private webinar please email us at [email protected] or reach out via the Contact page. We welcome visits by surgeons to observe our operations. A minimum of 12 weeks notice is recommended so that we can schedule the specific types of cases that interest the visitor. Visits can range from 1 day to several weeks depending on the needs of the surgeon. Please contact us at [email protected] for more information and to arrange a visit. Visit our YouTube channel at https://www.youtube.com/channel/UC_klaZqqRil1Q24scmItdmA. Unedited videos and short tutorials are added on a regular basis. We have discussed the latest evidence-based research and technical advancements in hypospadias repair at the American Urological Association annual meeting each year for many years. Please contact us for dates and times. Our specialists are available to travel to your institution to offer private instruction upon request by surgeons who wish to have hands-on experience operating on their own patients. 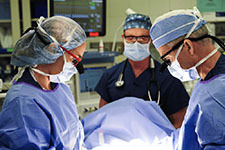 The host surgeon selects the cases and we will first demonstrate our technique and then involve the host as we coach. For more information please email us at [email protected].